Outdoor Interactive Sculpture. This is designed as a large 18 ft high urban electronic, interactive sculpture, featuring solar energy, electronics, light patterns, sound and reactionary effects combined with a sculptural form and Braille detailing. 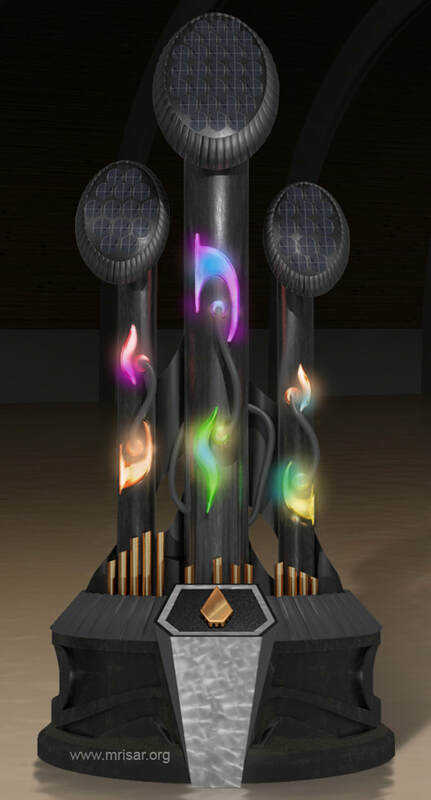 Utopia Rising Grande is a boldly designed sculpture that presents an otherworldly quality. Most of its exterior is comprised of a grayish silver granular finish set against a montage of illuminated abstracted segments and a slick black council with bronze detailing. The sculpture is designed to react to its environment through interpreting sounds, shadows and light. The electronics in it's interior are designed to respond to their surroundings by creating sounds and light patterns. ​Utopia Rising Grande is presented as an outdoor sculpture made to endure the elements and naturally age into the environment. The acrylic crystalline segments on the exterior are illuminated by numerous super bright LED's which are controlled by a number of PC boards inside the exhibit which are populated by CMOS, Linear, TTL, EEPROM and VMOS based circuits. In addition to the cost of the sculpture - it will require a concrete foundation and anchor bolts. The final outdoor installation will require a moderately sized crane and licensed contractor for the on site mounting of the base unit and positioning of the columns. 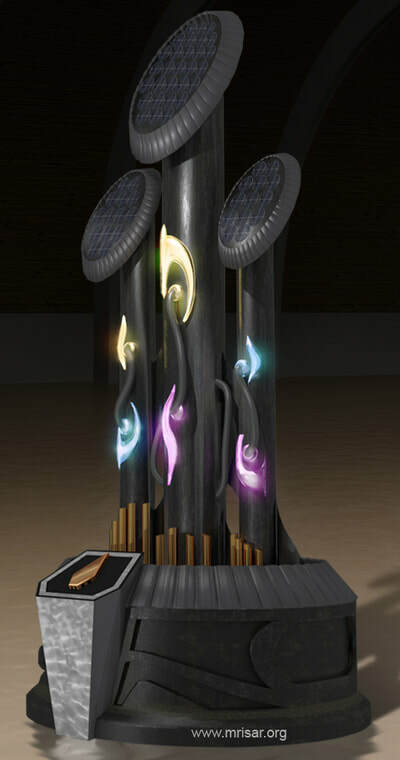 This sculpture is an example of alternative energy, sensory inputs and reactionary effects in electronic systems, timing and randomizing theory, visual and wave length specific electromagnetic emissions, photons, sound synthesis, frequency, amplitude, and acoustics. Contact us for price information. The exhibit touch circuit operates on a totally isolated power supply. The text supplied on the exhibit discusses theory, technology and applications. 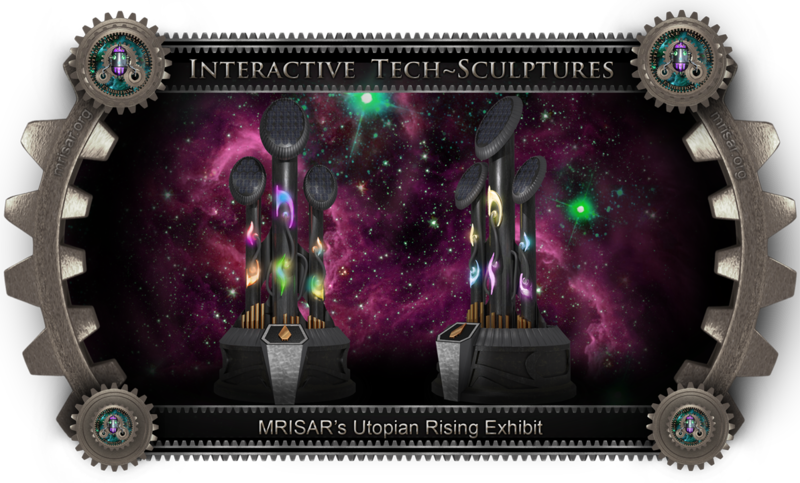 We also sell a shorter version of Utopia Rising for indoor use.